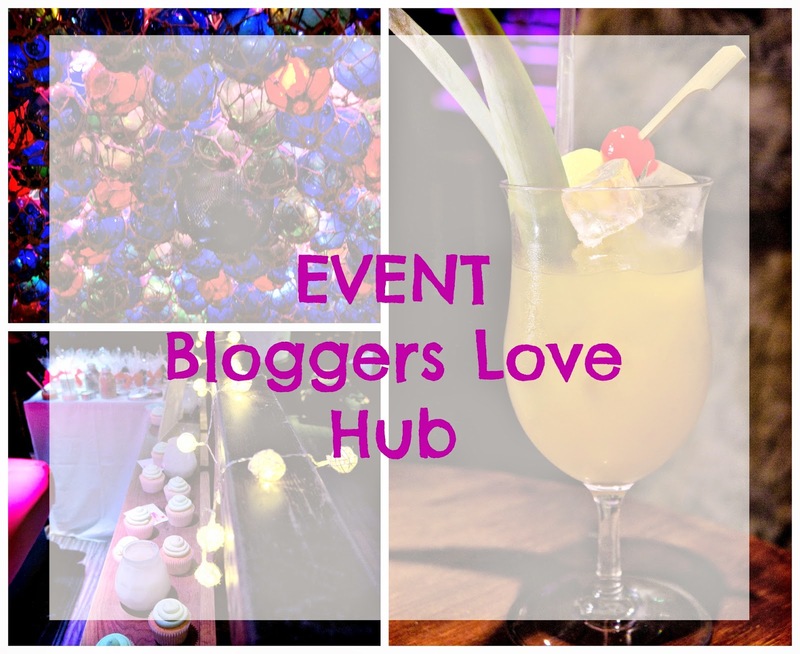 Last Monday, 3rd November, I went to the 1st Bloggers Love Hub event that took place in Mahiki, a Honolulu inspired party house in Green Park, London. The venue was gorgeous and the atmosphere was very fun and friendly. I met up with my friend Alina from Beauty With Charm and we went to the event together. At our arrival, we were welcomed by the lovely Lucie (from Fat Beauty x), who was the host. She kindly explained to us how the event worked and talked us through the schedule for the evening. 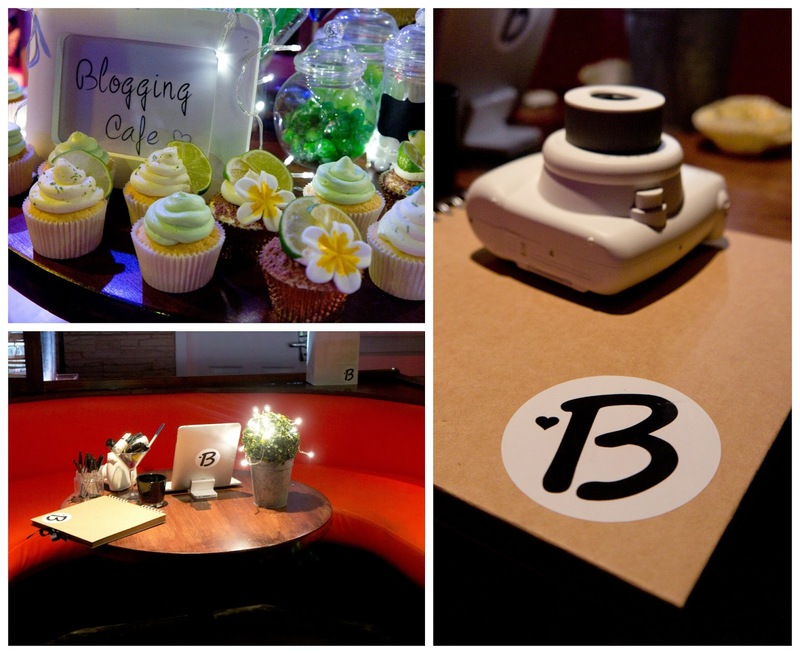 Straight away we spotted the "blogging cafe", a little dedicated space for bloggers with an iPad, a polaroid, a notepad and of course, sweets and some gorgeous cupcakes from Miss Cup Cakes. These were delicious, a real treat for the night. Alina and I went around all the stands and got to meet some lovely people and know more about a few really nice new brands, which I'll introduce to you briefly. Ndulge has a variety of therapeutic remedies to help cleanse, sooth and moisturise sensitive skin. For what I could see quickly at the event, their products do seem quite creamy and hydrating, but I didn't get to try anything properly. Made of Carpet is a company that makes bags from the finest quality rugs produced in Western Europe. I had never seen anything like these bags before and I thought it was such a brilliant idea. If anyone is interested in having a look on their website, they are offering 25% off discount with the code ROCKERS (upper case). STEAMChains jewellery is made of recycled pieces like old watches, charms, coins, etc. They also do personalised jewellery, including some bit and pieces that will make it very unique to the buyer. D-Jewelsus had some of the most interesting pieces I saw on the night. They were basically funky necklaces made of different texture and colour leather pieces. They looked pretty cool and I'm sure they'd brighten up any dull outfit. 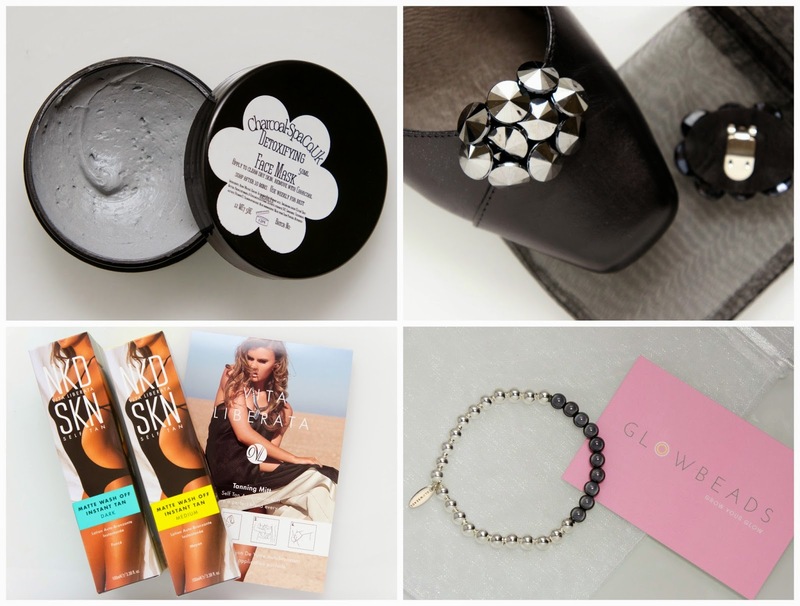 Charcoal-Spa.co.uk is a company that uses charcoal to create hand made products such as detoxifying salt scrub (£12), face mask (£9) and charcoal soap (£5). The products smell lovely and they are now available to order online. I was kindly given a detoxifying face mask to try. 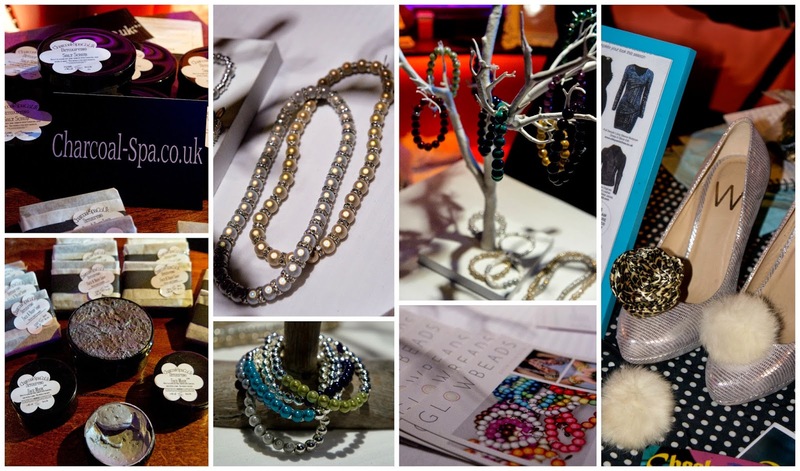 Glowbeads was another really interesting hand made jewellery company I got to know at the event. All their jewellery is made with a material that glows when the light hits them (same used to make cat eyes on the roads) and they are just really pretty. The product range includes Necklaces, Keyrings and Home Decorations. I was asked to choose an item at the party and I chose a bracelet, which I have been wearing since then and have already been given compliments on it. Another favourite of the night was Cheeky Poppins. They make shoe clips, which I thought was a genius idea. With these clips you can decorate shoes, headbands, bracelets, anything, really. They can easily turn a simple outfit into something fun. I absolutely loved them and was really excited to be given a pair of clips to bring home. I also really enjoyed getting to see again some girls from the Blogger's Tea Party. It felt like a little reunion. :D There was me, Alina, Lucie, Nadja, Olivia, Angelica & Bunmi. It was so nice to see some familiar faces and chat to the girls again. We left pretty much after the fashion show, that featured some of the jewellery brands and clothes. Unfortunately the lighting there was not so good for photography and I didn't manage to catch any shot from the catwalk. But overall, it was such a lovely event.